Immediately following the Cocktail Reception, the annual Awards Dinnner honours CITT’s academic award winners, the newest group of CITT-Certified Logistics Professionals (CCLPs), and the recipient of the prestigious annual CITT Award of Excellence. 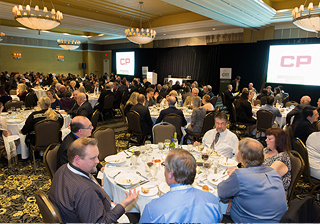 This a hugely popular social and networking event that traditionally has the highest attendence of any part of the Canada Logistics Conference program. For those attending the full conference, this event is included in your registration. Additional tickets—including corporate tables that seat 8 and are reserved with your company logo—are available so you can treat your clients or reward top performers by bringing them to this high profile event. For one-day conference attendees or those unable to attend the daytime program, individual tickets are available. It's not too late to join these leading organizations by sponsoring Canada Logistics Conference 2018!